Another Vintage Banana Tuesday has arrived! I didn't just want to post a recipe this time. 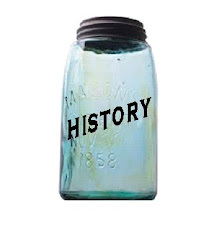 I wanted to make one. 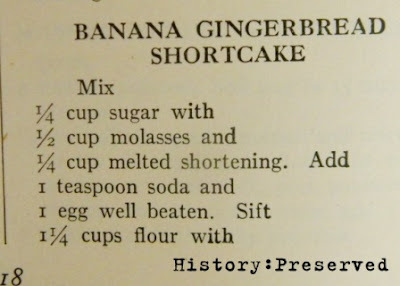 So, I decided on this interesting one from The Alice Bradley Menu-Cook-Book - Banana Gingerbread Shortcake! Fascinating combination, wouldn't you say? 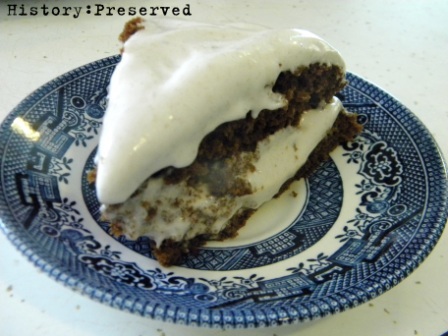 So, the recipe consists of two parts - the gingerbread cake and the banana cream filling. 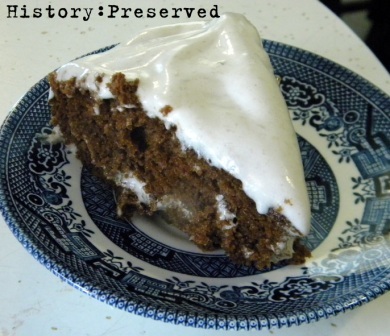 The gingerbread cake was a cinch to make. The only change I made was to bake it in my small spring form pan. I just didn't see how there would be enough batter to put into two cake pans like it says to, especially when they didn't specify the size. 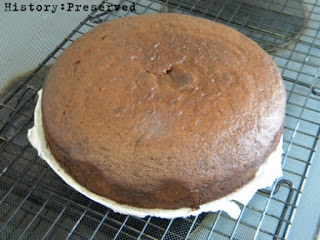 The recipe only calls for 1 1/4 cups flour, so I'm wondering if the standard cake pan back then was smaller than today's 9" size? 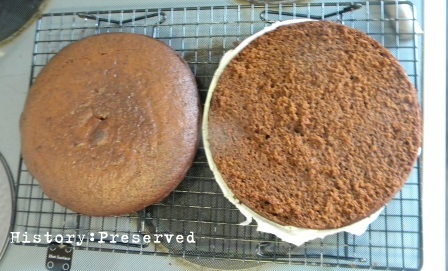 Also, I've never had to add boiling water to a cake mix before, so that was a different technique than I was used to. So, here's my cake! I think it turned out quite lovely and fat. Just the way I wanted it. Since I didn't have two cakes, I was planning on cutting this one in two. It worked out great! Seriously! If you've ever had to stand and stir or mix something for twenty minutes, it really feels like a lifetime. At first I felt it was completely unreasonable. 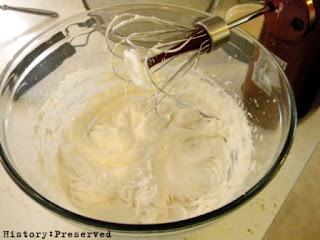 I muscled through it though and stopped short at 16 minutes, just because my beater's whisk is pretty amazing and cuts whipping down to a fraction of the time. So, why all the beating, you ask? 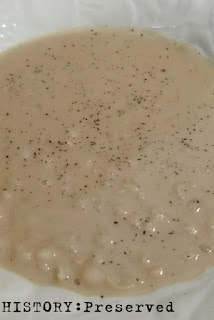 Well, since you're adding a whole banana and sugar to the egg white all at the same time, it takes awhile for the mixture to get glossy, light, and thick enough to be spreadable. It also beats the heck out of the banana so it's as smooth as possible. So, I grudgingly agreed that 20 minutes was probably reasonable. I guess. 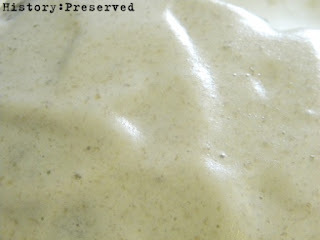 Here's a close up of the Banana Cream Filling. You can see the flecks of banana. Here's the cake with the banana cream filling spread on and in between the layers! Isn't it pretty? At least in all its imperfections... haha! 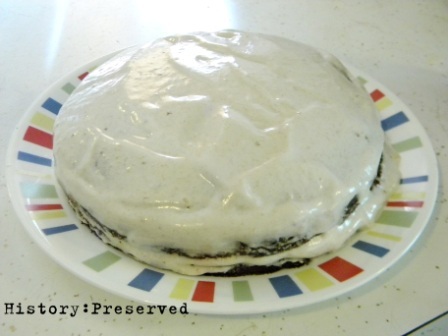 I bet you're wishing this was a chocolate cake, aren't you? Actually, the banana spread would taste pretty good on a chocolate cake! There's no one saying we can't do it. So why not? I had to get a shot from both angles. Haha! So for the taste test: the gingerbread cake was quite wonderful. 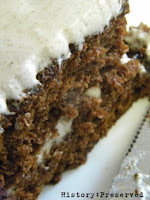 It had a great texture, was soft and a little dense, but in a good, substantial way. The banana cream filling was like eating banana-flavored marshmallow! It's definitely an interesting pairing with the gingerbread, but they work. Success! There wasn't much that resembled a shortcake as we know it though... 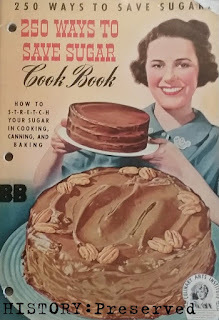 Except maybe that the cake was easy to make. I'd definitely say that eating it fresh and slightly warm is the best. 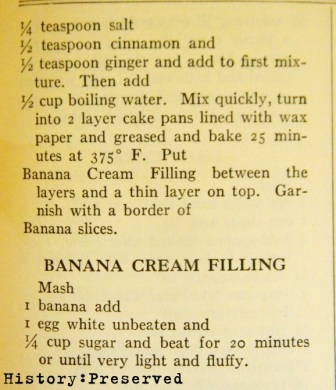 As time passes, the banana in the filling/spread browns. By the next day, the white creaminess has turned an unappetizing tan. Blech. It still tastes fine, but it's just ugly to look at. Give this one a try. You might be surprised! I think it sounds delicious! Definitely worth a try!